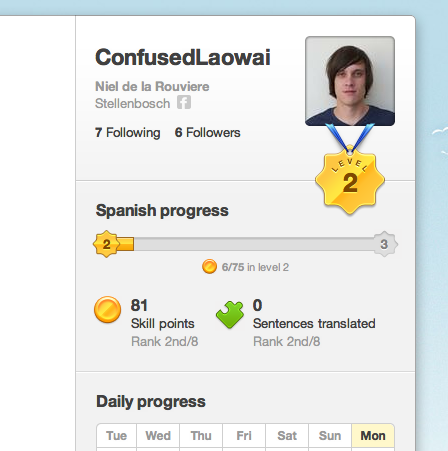 Ever since I heard about Duolingo, I was hooked. Their catchphrase is “Learn a language for free, and simultaneously translate the Web”. Nifty I thought. Why not crowdsource micro translations and learn the language as well? That’s exactly what Duolingo has done. I got an invite to test the website two weeks back. I’m impressed thus far. As you can see, I’m learning Spanish. They only have Spanish, German and French at the moment. What I like about Duolingo, as opposed to other online language learning sites, is that one, it’s free, but secondly they take a cool approach. One that has been in the back of my mind for some time now. Using a tech/skill tree to progress in a language. Having a clear linear progress shown almost like you’re playing real-time strategy game. Another addition is that of the “stream”, where you follow other users and see what they get up to. This adds interesting motivation for me. It’s social but also a tiny bit competitive. They also have built in communities to ask and answer questions. The natural language processing is also quite intuitive. It can detect if I speak something correctly and also detect tiny stuff, like typos in my input. I like this. It’s not just static. Lastly, you can translate actual content that people want to get translated. You get points and practice the language. Head on over. They are launching Portugese and Chinese next. When exactly, I’m not sure. When it launches in Chinese, I’ll be able to review their syllabus with a keener eye. For now, I’m digging the Spanish learning.